I remember my first Valentine’s day with Jac: she took me on a surprise date to King’s Park with a picnic basket loaded with KFC. Do you remember your first Valentine’s date with your partner? Almost 18 years later, another Valentine’s, another surprise date. Jac booked the restaurant; I didn’t know where we’d be dining until we pulled into the car park. 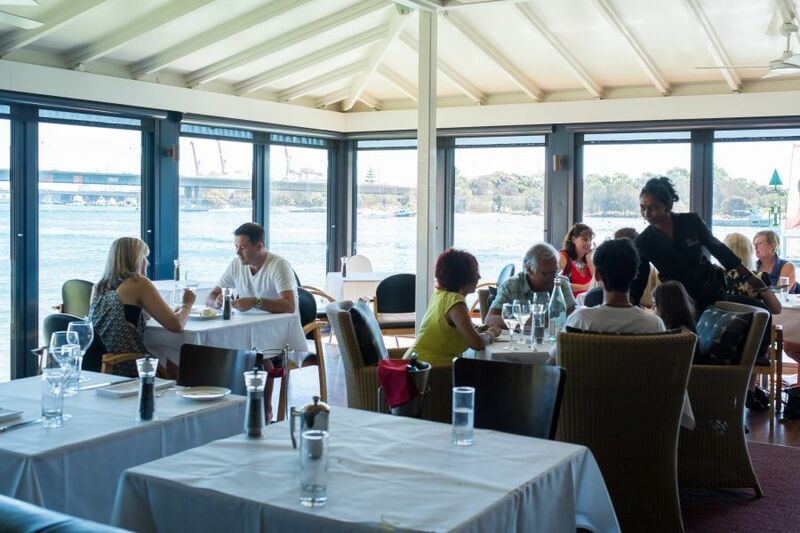 She’d made us a reservation for lunch at The Red Herring – a seafood restaurant by the water, which meant big windows with great views – and on a glorious blue sky day such as this, excellent light for photographs. This was not a coincidence; after all these years together, she knows exactly what floats my boat. 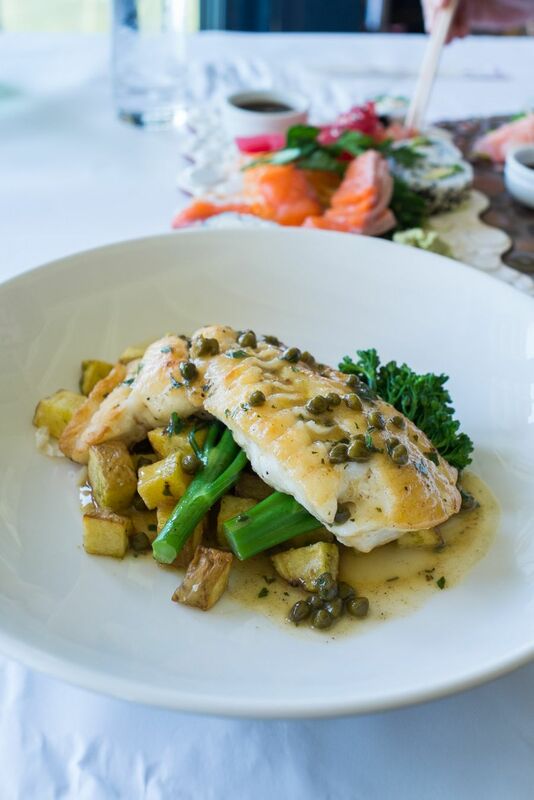 We deliberately avoided dining out on Valentine’s night itself, with its ‘special’ menus and the pressures of the occasion. 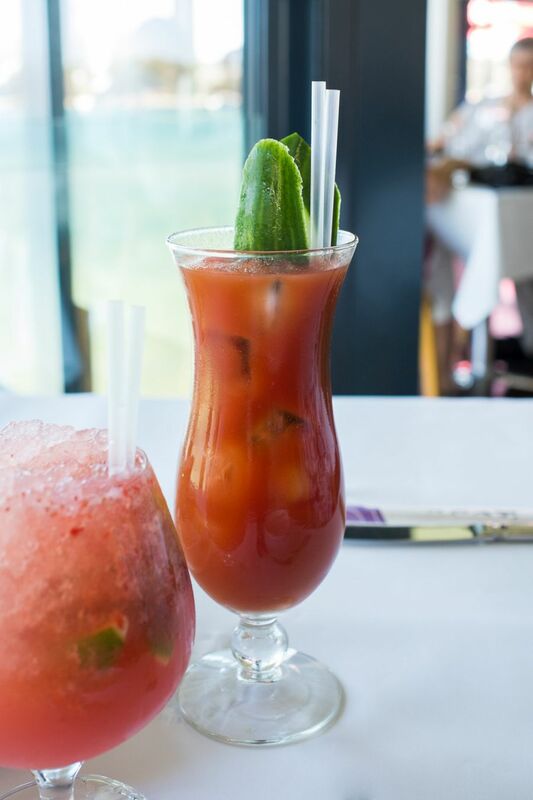 A toast to 18 years, surprise dates and lazy lunches, with a Bloody Mary for Jac and a refreshing Freo Doctor Punch mocktail for me. 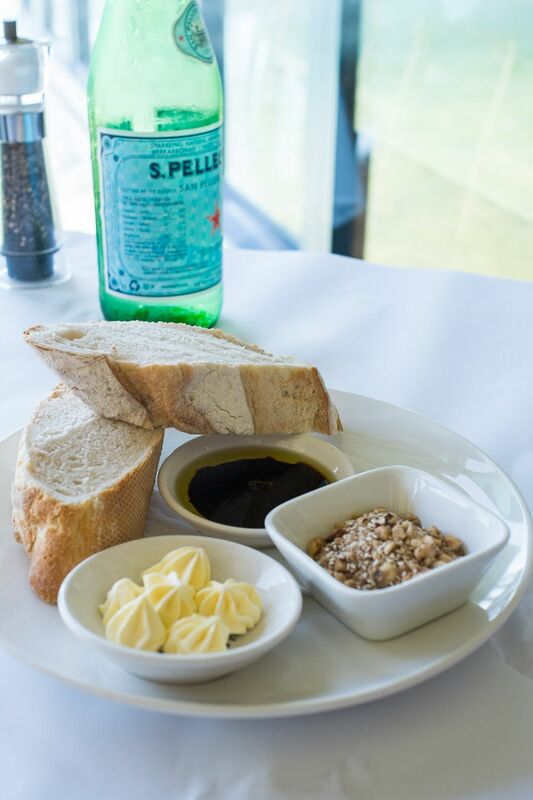 ‘Crusty baguette straight from the oven’ sounded good, but we weren’t so keen on the accompaniments of WA olive oil and dukkah. Butter was cheerfully provided upon request, but disappointingly was pre-piped unsalted butter fresh from the fridge, bland and a bugger to spread. The bread was fabulous though – chewy, and crusty as described. For her entree, Jac chose a half dozen oysters, three natural with fresh lemon, and three with miso and pickled ginger. 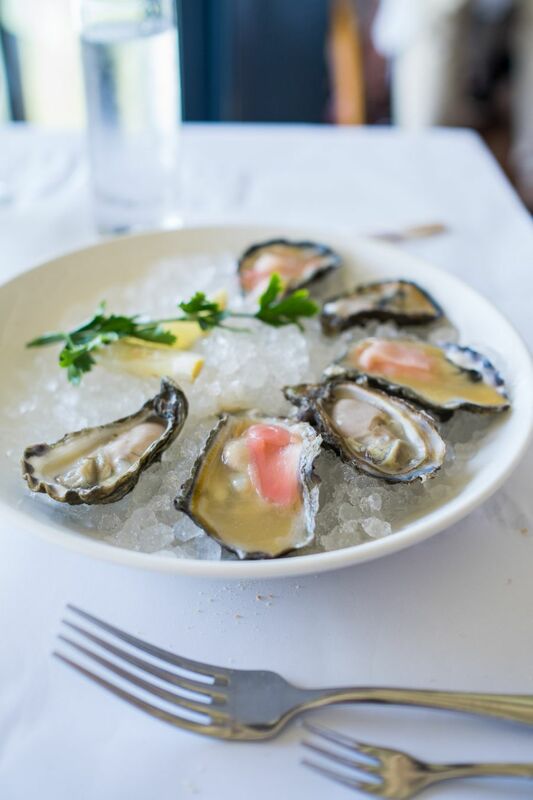 These plump, juicy South Australian beauties were served on crushed ice. 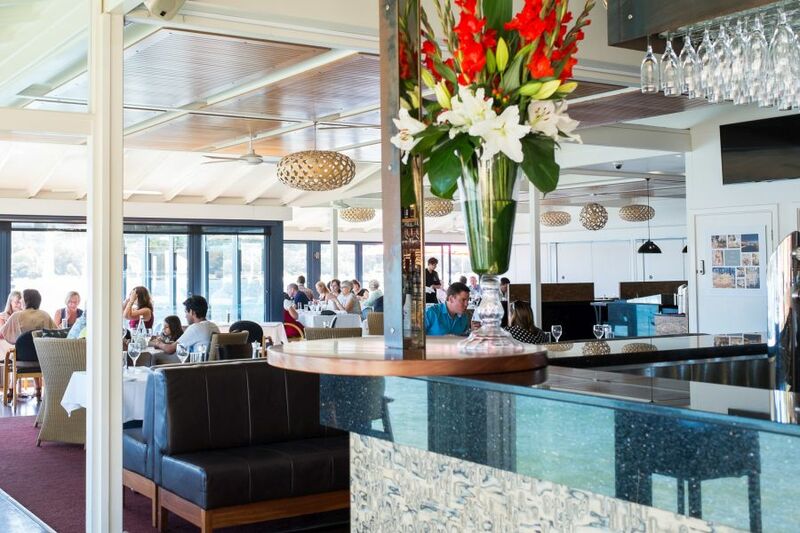 Many restaurants around Perth seem to favour serving oysters on rock salt, which I don’t have a problem with when they’re served hot a la Kilpatrick or Rockefeller; but when the oysters are served natural or cold dressed, ice keeps them chilled and at their best. 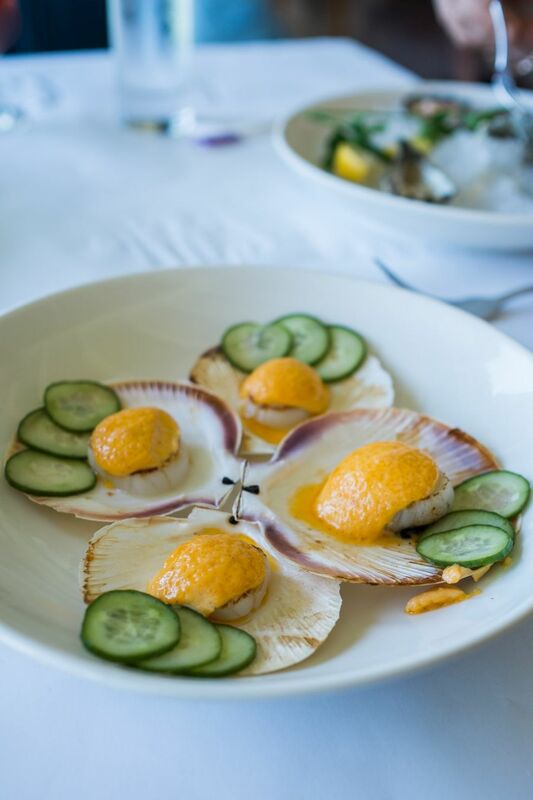 I chose the Esperance half shell scallops grilled and served with chilli mayo and pickled cucumber. The four lightly grilled scallops were each topped with a thick blob of warm chilli mayo, a very mild heat that didn’t overpower the delicate scallops. With only four scallops per serving, you’re not going to want to share. 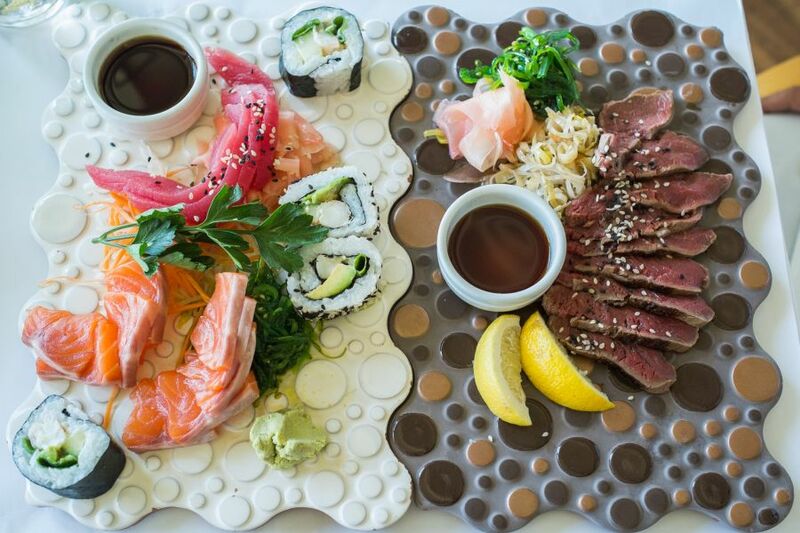 For main course, Jac chose two raw entrees from the Sakana Bar menu, served on two plates that fitted together like a jigsaw puzzle. 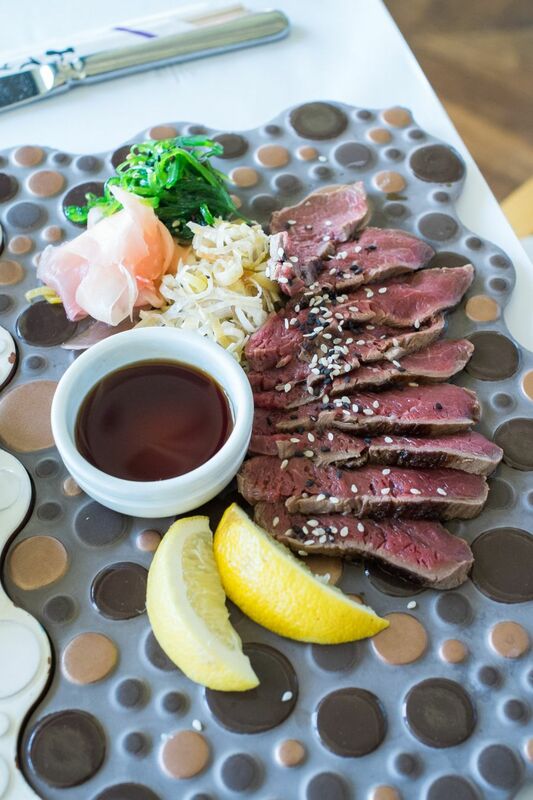 First, beef tataki – thinly sliced aged beef fillet served with slow braised leek, pickled ginger, wakame (seaweed) and ponzu sauce. 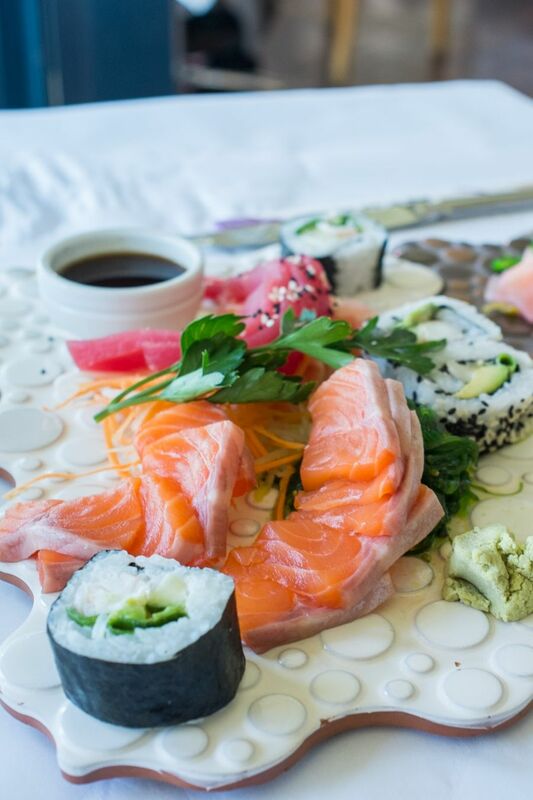 Second, the sushi and sashimi plate, with salmon and tuna sashimi and California rolls and an enormous knob of wasabi. The beef, slow braised leek and fish were excellent, but the sushi rice was disappointingly mushy. 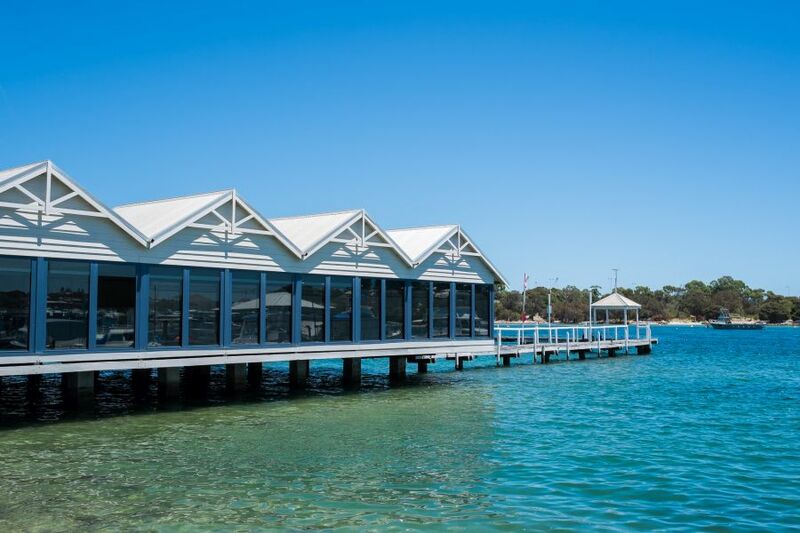 I was tempted by the free range spatchcock chicken chargrilled with chilli, garlic and tarragon, served with sweet corn and roast capsicum – but it didn’t feel right to order chicken in a seafood restaurant. 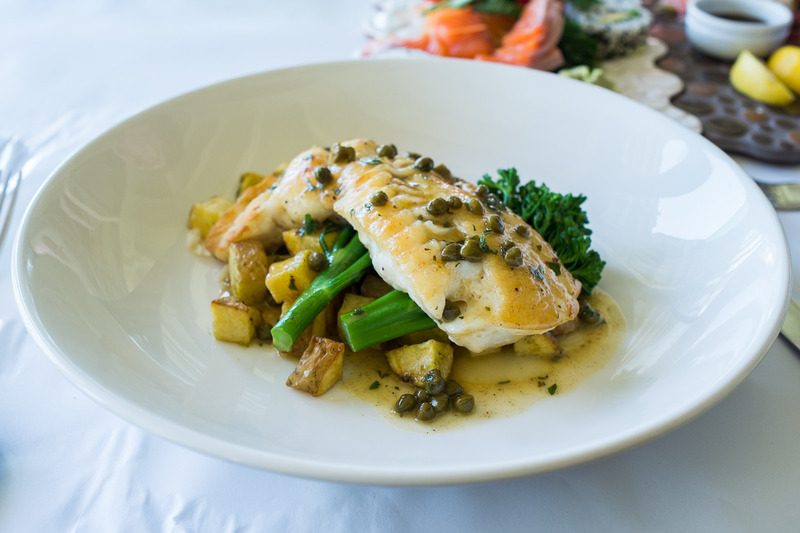 In the end, I chose one of the day’s specials: gently grilled groper with broccolini, skillet potatoes and a very tart lemon caper sauce. After my first forkful of that beautiful piece of tender meaty fish, I knew I’d made the right choice. 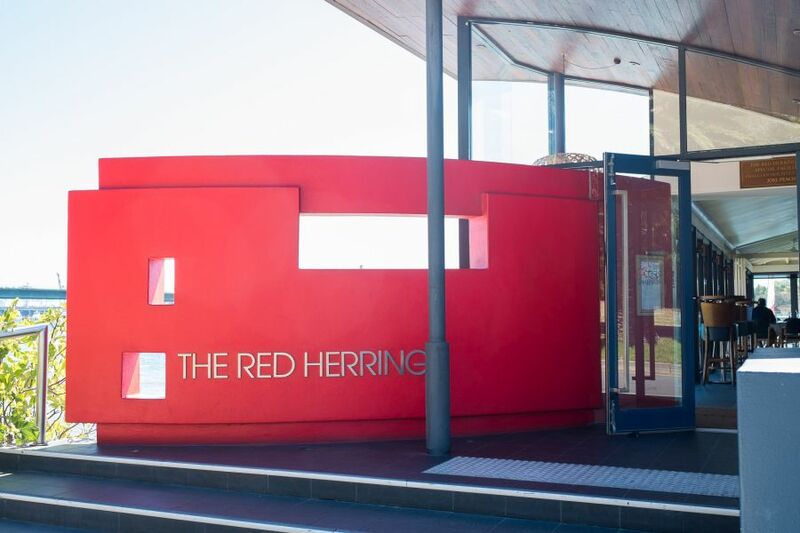 I liked the menu at The Red Herring – the desserts are included at the back rather than on a separate menu that’s revealed only after main course – so you can decide if they’re worth leaving space for. In this case, the desserts were an enticing read and we prepared by skipping a side dish to go with our mains. For Jac, vanilla bean panna cotta which ticked all the boxes: wobbly, silky smooth, every soft spoonful a dream. 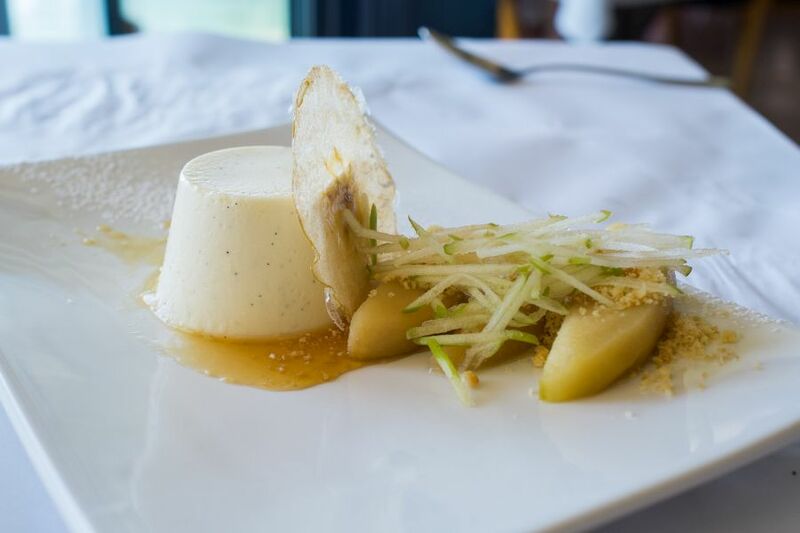 It was accompanied by shortbread crumble and different textures of apple: Granny Smith apple toffee, apple crisp, stewed apples and julienned fresh apple. 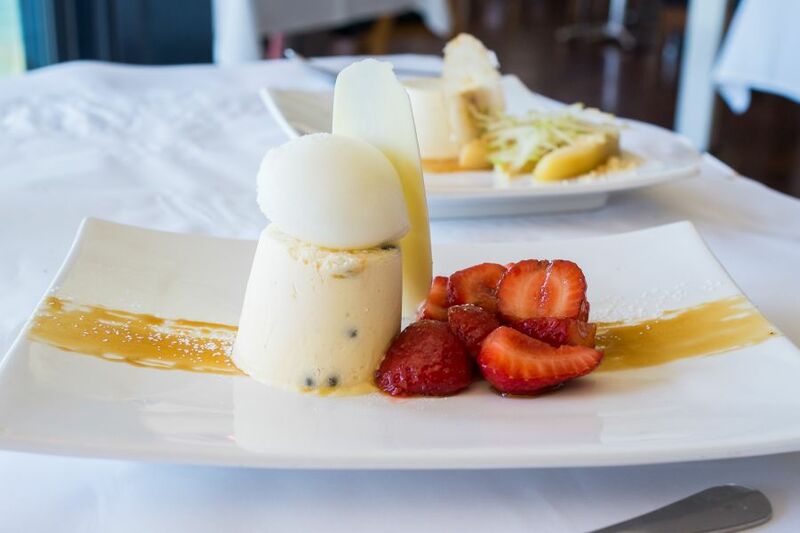 My dessert was described on the menu as ‘lime and passion fruit semi freddo’ with Frangelico infused strawberries, but was really passion fruit semi freddo topped with lime sorbet – not that I’m complaining – both tasted fresh and fruity. The passion fruit seeds added crunch. And standing upright on the plate like a piece of modern art between the frozen items and boozy berries, a chewy piece of white chocolate. We’ve come a long way since I was delighted by a surprise basket of KFC in the park. It was a lovely lunch. 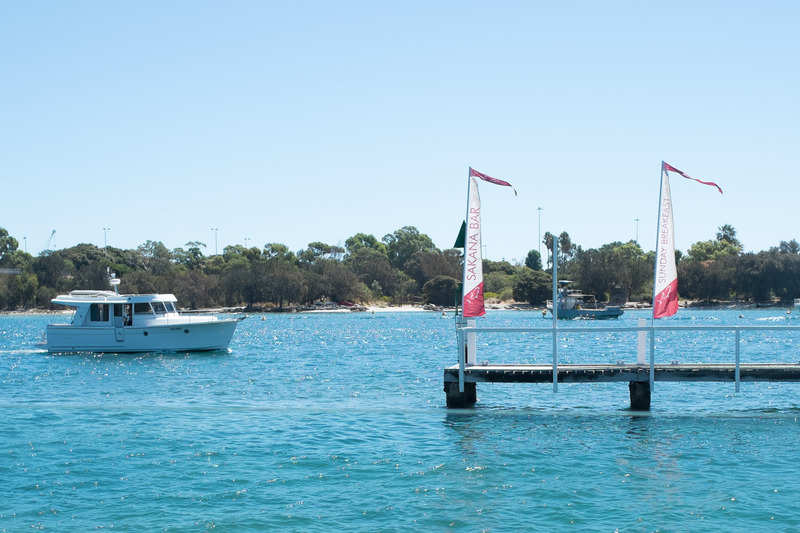 As we demolished our food, we talked about our holiday plans for this year, watched the sunlight flickering on the water, and admired the numerous boats cruising by. We were spectators to a fierce battle between two birds for a fish. The pelican won, thanks to its bigger beak. As for us, home for a nap. That’s true love.